The GSMA has a presence in the Latin American region, with teams based in Santiago (Chile), Buenos Aires (Argentina), and most recently in Sao Paulo (Brazil). GSMA Latin America is focused on managing and delivering the Regional Interest Group (RIG) priorities defined by its members through GSMA governance bodies, as well as coordinating working groups and events. The team is also responsible for representing the GSMA’s views and initiatives at regional institution meetings and events. Lucas currently serves as Acting Head of Latin America, based in Buenos Aires. He is currently focused in the mobile industry developments and key regulatory decisions related to connecting everyone and everybody for a better future, engaging with Governments, Operators and players in the Mobile ecosystem. Before joining the GSMA, Lucas built a broad experience in project management and Support in multinational companies such as Ericsson and Nokia, with over 10 years’ experience in the telecoms industry. Lucas completed a Masters in Business Administration from Universidad Torcuato di Tella (UTDT), holds an Specialization in Telecommunications Management from Instituto Tecnologico de Buenos Aires (ITBA) and has a degree in Telecommunications Engineering. Besides, Lucas speaks fluently Spanish and English. Amadeu Castro is the Director responsible for representing GSMA in Brazil, including the setting-up of the office of the Association in the country. In the last decade, Amadeu has served as consultant to various companies in the telecommunications sector on matters of policy and regulatory strategies. In the same period, he was CEO of National Association of Cellular Operators (ACEL) and Senate representative on the Advisory Council of Anatel. Previously, he served in the Anatel as Radiofrequency and Control Superintendent, Executive Superintendent and Substitute Consultant. Prior to its experience in Anatel, Amadeu served in the Ministry of Communications of Brazil as Director of the Planning and Engineering Department and head of the Brazilian delegation at the World Radiocommunication Conference of the ITU in 1995 and 1997. At CITEL, he was Vice President of PCC III Radiocommunications. Amadeu is graduated in Electronic Engineering from the University of Brasilia. Alejandro is from Argentina and has a degree in Electronic Engineering from the National Technological University, a Masters in Business Administration from the University of CEMA and postgraduate qualifications in Marketing from the University of California. He has extensive experience in the field of ICT, holding various management positions with Telefónica group before joining the GSMA, including Director of Marketing, CEO of Terra Argentina and VP of Wholesale Business, Regulation and Strategy for Argentina. Before that Alejandro worked at NEC and in a range of technology and service companies. His areas of expertise are developing technological businesses and designing strategies in the ICT field. Paula joined the GSMA in 2014 with the purpose of bringing together the mobile industry’s contribution to SDGs and the Latin American government’s social objectives in the We Care campaign. In her current position as Regional Marketing Director for Latin America , she is also representing the GSMA as Topic Chair for Digital Inclusion theme within the W20 (Women 20) group, which will advise the G20 member states on issues around gender equality and the economic empowerment of women. Before joining the GSMA, Paula held progressive communications and marketing positions in companies such as British Telecom (formerly known as Comsat Lockheed Martin), Pamar Jacques Whitford, Reader ´s Digest and worked for ProMéxico, the Mexican federal government agency responsible for attracting foreign investment. She has also been a teacher and an independent consultant. Paula holds a BA in Public Relations and post graduate studies in marketing communications and digital transformation. Marco is Senior Director of Strategic Engagement for the GSMA in Latin America. He has more than 26 years’ experience in the telecommunications, media and internet industry in the areas of technology, strategy, innovation, business transformation, corporate venture capital (CVC), partnerships, regulation, public policy and operations. He has worked at IBM, Telmex, América Móvil and venture capital firms and is a board member of a number of companies involved in social innovation. Originally from Mexico, Marco teaches on postgraduate courses in computer and information sciences and telecommunications. He is a mathematician and physicist, with postgraduate qualifications in maths and computer science, and has studied business at Stanford and Haas School of Business. Bernardita joined the GSMA in June 2005 and is responsible for marketing activities, sponsorship and event organization of GSMA Latin American office. She has been responsible of coordinating GSMA LA plenary events for the last 5 years and developed the GSMA LA Vision Magazine. Before joining the GSMA, Bernardita was Regional Marketing Coordinator at Microsoft and worked for advertising agencies such as Young & Rubicam (for Colgate Palmolive global account) and Lowe among others. She has over 17 years of experience in the marketing and advertising areas. Bernardita holds a degree in Marketing and Advertising from the Universidad Diego Portales, Chile. Alexis joined the GSMA in July 2005 and is responsible for conducting GSMA LA technology and business-related initiatives. He coordinates operator expert working groups and task forces and helps operators develop industry positions. Alexis also represents the GSMA in international forums such as CITEL and Regulatel and is key regional spokes person on roaming issues. Before joining the GSMA, Alexis built a broad experience in business/projects management and products development in multinational companies such as Ericsson, Agfa and BellSouth, with over 15 years’ experience in the telecoms industry. Alexis has a degree in Electronic Engineering and an MBA from the Universidad de Chile. Besides his native Spanish, he speaks fluent English, and effective Portuguese and Italian. Fabio joined the GSMA in 2013 as Strategic Engagement Manager and is responsible for engaging key ecosystem stakeholders and securing MNO alignment with GSMA programs to promote adoption of globally interoperable capabilities and services with focus mCommerce and Future of Communications. He built his career in Telecommunications in Business Development and Sales roles in Siemens, Nokia Siemens Networks and Giesecke & Devrient, with working experiences in Brazil and Germany. Fábio has a degree in Electric Engineering from Fundação Armando Álvares Penteado and MBA from Fundação Getúlio Vargas. Alfredo is an electronic engineer specialising in telecommunications (Buenos Aires Institute of Technology) with more than 10 years’ experience in the telecommunications industry working for leading international firms. He is a technology consultant for regulatory affairs and has extensive experience as a project leader in developing, implementing and improving performance in a wide range of technologies and systems. He has gained experience at executive level and worked for one year in Brazil. Alfredo is a certified Senior Project Manager (Ericsson) and a Project Management Professional (Project Management Institute) and has completed further training courses in leadership skills (IAE Business School, Ericsson Academy) and project management. Lucrecia is currently serving as Senior Policy Manager at GSMA Latin America, based in Buenos Aires. She is focused on regulatory initiatives throughout the region on Digital Inclusion, Regulatory Modernization, Competition, among others. She also supports the coordination of the Regulatory Working Group for Latin America. Before joining the GSMA, Lucrecia worked as an Advisor in international affairs at the Social Development Ministry and as an Advisor on legislative committees in the National Deputies Chamber and at the Buenos Aires Province Senate. She has a Master Degree in International Studies from the Torcuato Di Tella University and holds a degree on Political Science from the Catholic University. Paloma is Policy Manager at GSMA Latin America, based in Buenos Aires. Her work focuses on regulatory issues in the region, including competition, regulatory modernisation and digital inclusion. Before joining the GSMA, Paloma worked as a legal analyst at a boutique firm specialising in telecommunications, broadcasting, and economic and digital regulation, and as a regulation and public policy consultant with Argentina’s telecommunications regulatory body and Ministry of Modernisation. Paloma has a law degree from the University of Buenos Aires, with a specialism in public and international law, and was a Visiting JD at NYU School of Law for one semester. She holds a Diploma in Internet and Communications Technologies Law from the University of San Andrés and is currently studying for a Masters in Law and Economics at Torcuato Di Tella University. Eugenia holds the post of Office Manager at the Buenos Aires office, where she develops, coordinates and manages financial, logistic and administrative matters. Before joining the GSMA, she worked in finance and management and monitoring and logistics in leading Argentine organisations such as energy company YPF. Eugenia gained extensive experience in the area of investments and project coordination by working at two major Israeli companies engaged in corporate finance and holds a degree in administration from the University of Buenos Aires. Nicolás Forster actualmente se desempeña como Outreach Director Latin America dentro del equipo global de IMEI Services de GSMA, basado en Buenos Aires. Se enfoca principalmente en el desarrollo de estos servicios en la región, colaborando con los miembros y diferentes organizaciones comerciales pertenecientes al ecosistema móvil en la adopción y utilización de estos. Posee una amplia experiencia en corporaciones globales, industria digital y telecomunicaciones. Antes de unirse a la GSMA, se desempeño como gerente regional de desarrollo de nuevos negocios en Yahoo! Hispanic Americas, así como también como gerente de estrategia e Innovación en Telecom Personal Argentina, liderando el desarrollo de nuevos servicios y los esfuerzos de innovación. Es licenciado en publicidad y marketing de la Universidad de Ciencias Empresariales y Sociales (UCES), distinguido con medalla de honor a mejor promedio. Florencia serves as Marketing Communications Manager at GSMA Latin America, based in Buenos Aires. She is in charge of leading press, PR, social media and content development activities in the region, in close collaboration with the global PR team and all marketing teams across the organization. Before joining the GSMA, Florencia worked as communications and training content coordinator at the Argentinean Ministry of Modernisation. She holds a degree in Communications from the University of Buenos Aires (UBA) and is currently studying to get a Masters degree in Content Management at Austral University. Andrea is Senior Engagement Manager for the Capacity Building programme of the GSMA. Based in Santiago, Chile, she manages the CE-Digital programme, a capacity building partnership with CAF and ECLAC2018 in Latin America. Andrea holds a Master’s degree in Linguistics and a Bachelor’s degree in English Education from the University of Santiago of Chile. With the aim of promoting GSM (Global System for Mobile Communications) technology among operators and users across Latin America, GSMA Latin America (GSMA LA) was founded in 1998. The GSM Association dated back some eleven years earlier, but with the creation of GSMA LA, the technology that was on its way to achieving the highest penetration worldwide also expanded into Latin America. The first companies to adopt this standard in the region were ENTEL PCS in Chile and Infonet in Venezuela. A short time later, other operators in Paraguay, Venezuela, Peru and Bolivia signed on for GSM as they became aware of its benefits. Since then, the technology has expanded continuously and today more than 98 mobile operators in every country of Latin America and the Caribbean use this technology. Three years after the founding of GSMA LA, its working groups were born. These groups are comprised of experts from the mobile operator companies that are members of the association. They meet several times each year to share and debate topics of interest that affect or could affect operators and more broadly, the industry. The groups include Regulatory (REGU), Billing and Roaming (BARG), Technical and Terminals (TECT), and Security and Fraud (SEGF). One of the most important tasks of these groups is to draft position papers. All member operators can participate in this process, giving their opinions on key issues that affect the continent. These papers are generally presented at the meetings of the Inter-American Telecommunications Commission (CITEL) and other forums where government officials, regulators and industry reps come together. 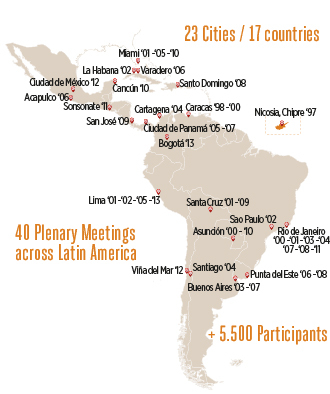 The current strategy of GSMA LA is to organize two plenary meetings per year, rotating among the different countries in Latin America. At these meetings, the four working groups meet and workshops and panels are held on the most innovative mobile industry services. Government officials, regulatory agencies and the top executives from regional operators all attend the meetings. In addition to its involvement in all of the events related to the telecommunications industry in Latin America, GSMA LA is taking an increasingly active role in the key debates for the development of the regional market. Its contributions extend to areas like regulation, antennas, roaming, spectrum, mobile broadband, taxation, mobile payments, terminals and privacy, among the many fundamental issues for the development of mobile services in the future. With the clear target of improving the service to GSMA LA members and expanding the association’s presence in the region, the organization has appointed a director to oversee the Latin American region. This post was created in 2010 and it is currently held by Sebastián Cabello, who works with a permanent staff in offices located in Santiago (Chile), Buenos Aires (Argentina), and Brasilia and San Pablo (Brazil). With this work team, GSMA LA strives to meet the objectives and goals outlined in conjunction with its member operators for the projects, events and initiatives that are developed over the course of the year. The governance of GSMA LA took an important turn at the start of 2012, when the Chief Regulatory Officers Group for Latin America (CROG Latam) was created. This group is comprised of senior public policy representatives of the largest groups of operators in Latin America and the Caribbean. CROG Latam is the main governance body of GSMA LA and it currently oversees GSMA’s public policy activities in the region. It works to ensure that the interests of Latin American carriers are taken into account on the agendas of the GSMA Board, the Public Policy Committee (PPC) and the Global Chief Regulatory Officers Group (CROG). According to data from the second quarter of 2013, there are 163 national mobile operators in the region and technologies from the GSM family are responsible for approximately 669 million connections, or 97% of all mobile connections. 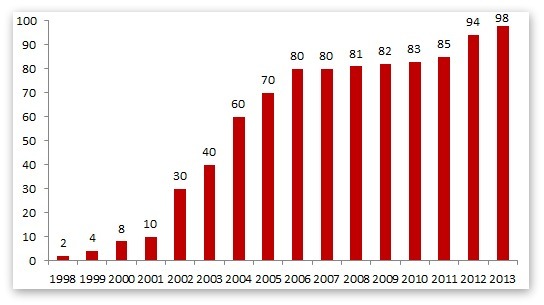 The average mobile penetration in Latin America exceeded 113% in June 2013: the GSM platform allows 514 million voices (2G) to connect while giving 174 million Latin Americans broadband access (3G). When GSMA LA was born, the GSM platform was mainly in use in Europe, and was just beginning in North America. Today, Latin America is interconnected thanks to GSM and on its way to launch a new generation of LTE networks that will allow the region’s mobile operators to provide a series of innovative mobile services that will lay the groundwork for continued growth. Along the way, GSMA Latin America will continue to support its member operators in all of the key aspects of the mobile business.